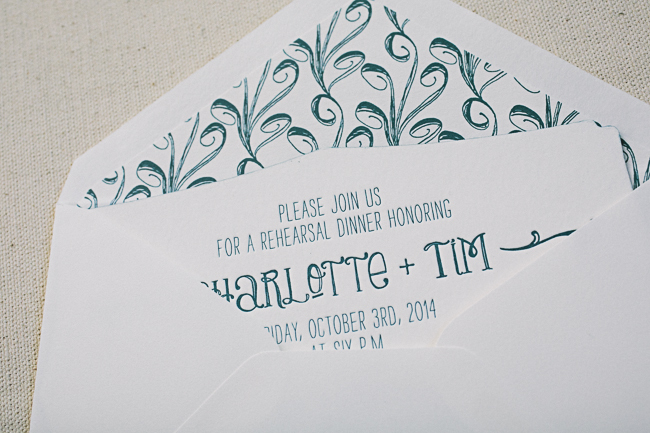 rehearsal dinner invitations - Smock. 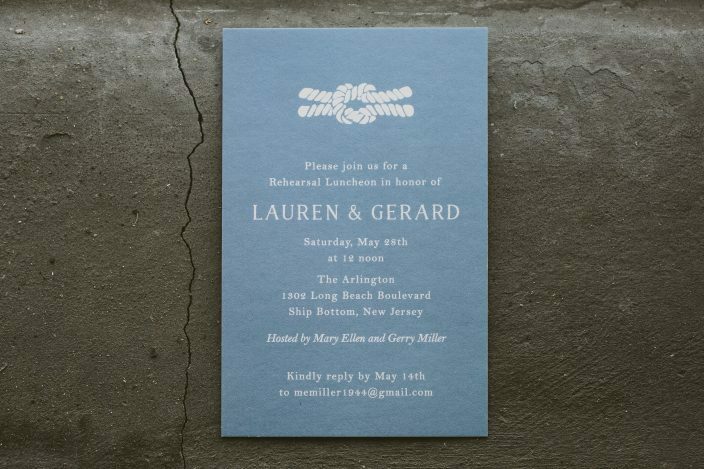 We worked with Adrienne at Ipanema Press to create these chic nautical invitations for Lauren and Gerard’s rehearsal luncheon at The Arlington. 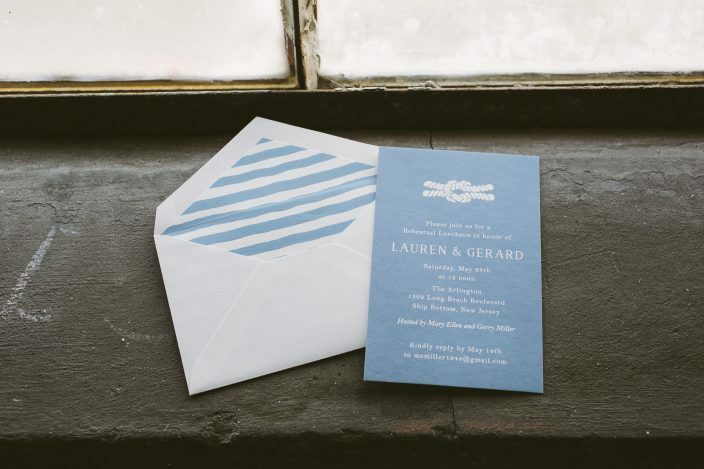 Our Prescott design was personalized with the addition of a knotted rope motif and custom striped envelope liners to keep with the the venue’s seaside style. 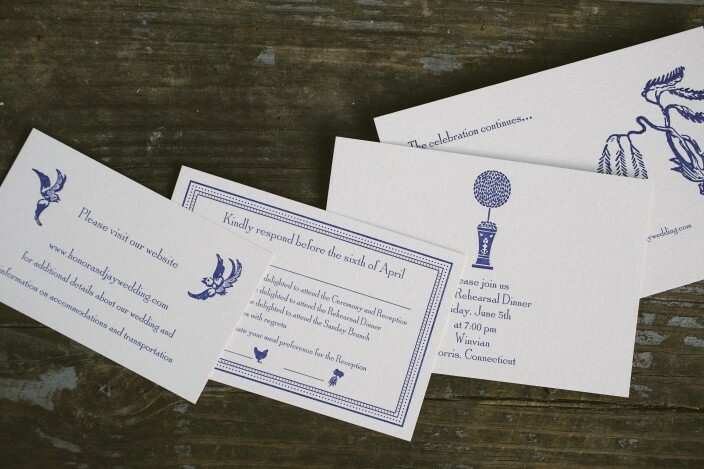 An email was provided right on the invitation to collect RSVPs – an eco way to cut down on paper and postage! 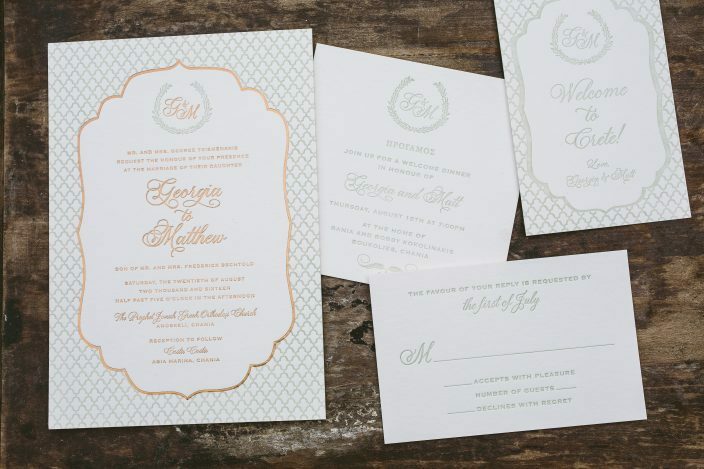 For their springtime rehearsal dinner at the University Club of Memphis, Carolyn and Keithley customized our Chapman design with elegant laurels from our motif library. 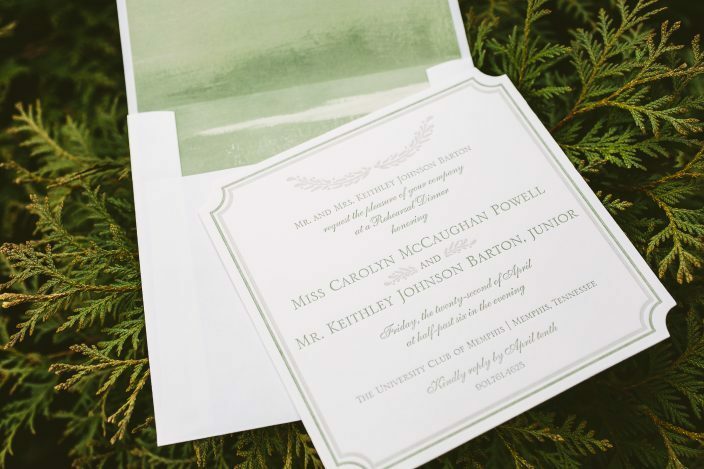 The invitations were printed in a sophisticated color palette of sage and dove inks on our ivory paper, and paired with a sage green watercolor envelope liner. 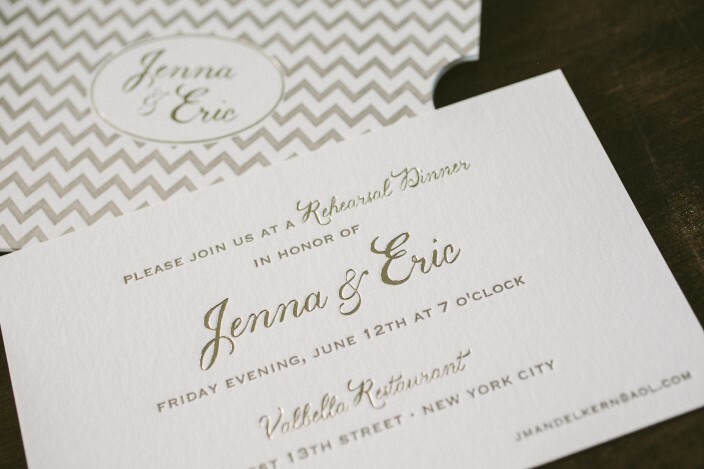 Our Belmont die-cut shape added a sleek finish to this elegant invitation set! 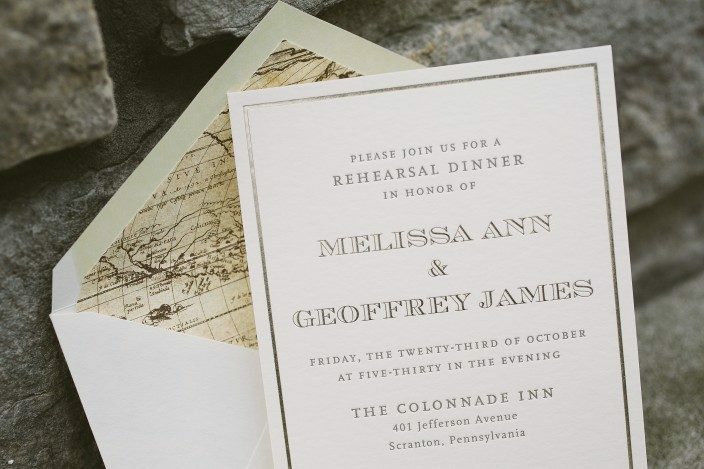 A stately venue calls for a stately invitation! 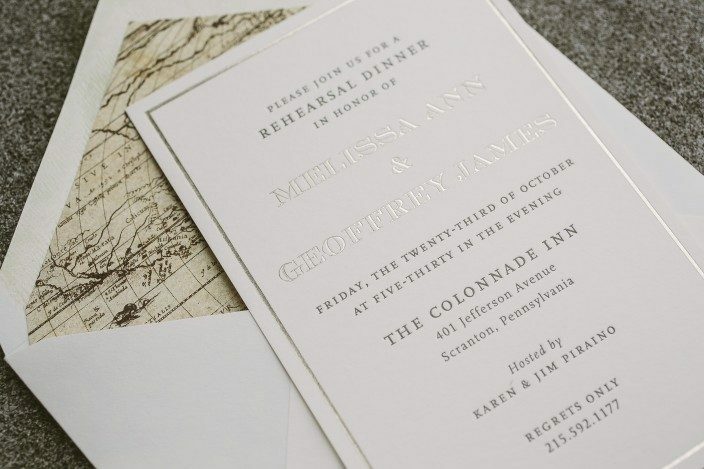 For Melissa and Geoffrey’s rehearsal dinner at The Colonnade Inn — an elegant estate that dates back to the 1870’s — we created a custom version of our Haynes rehearsal dinner invitations. 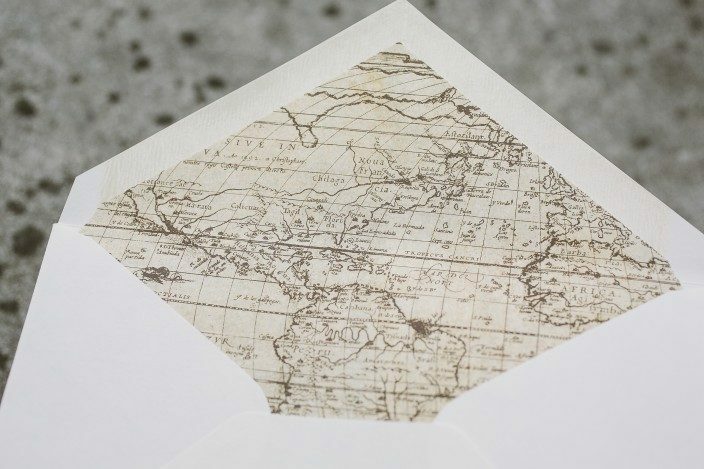 A vintage world map pattern was used for the envelope liners, which accentuated the old-world charm, while hints of tawny matte foil and classic fonts combined for a modern yet timeless look. 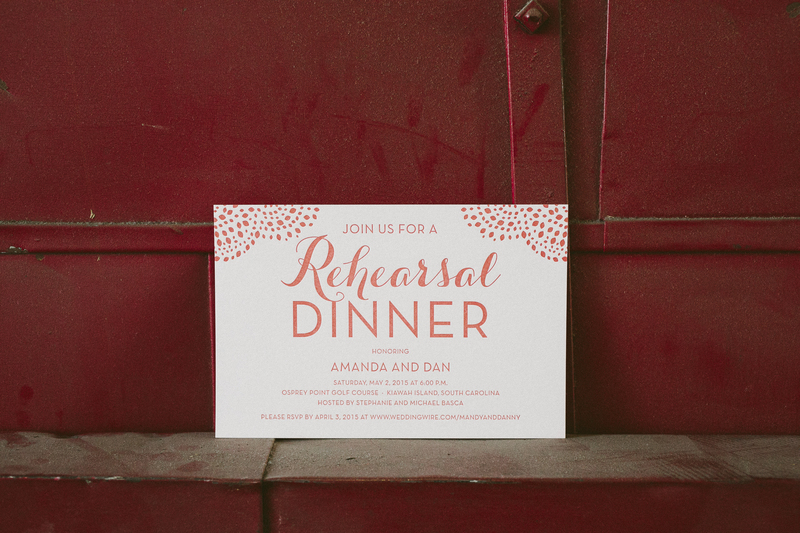 Hutton and Jan chose our Rainier design to set the tone for their rooftop rehearsal dinner. 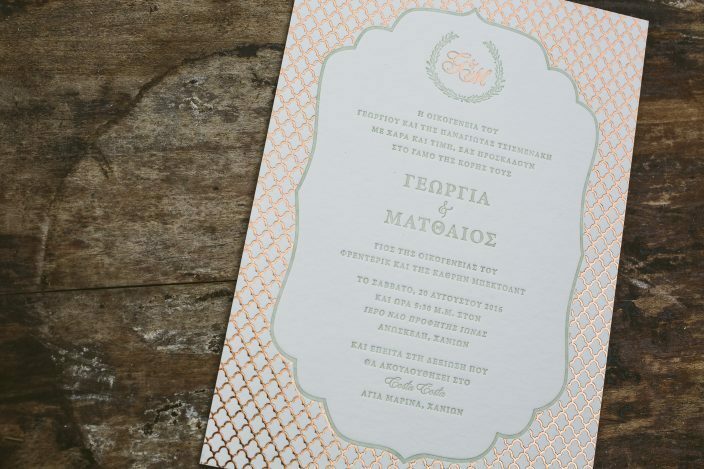 We letterpress printed their Tiffany blue rehearsal dinner invitations on our white bamboo paper, and created matching envelope liners that mirrored the design’s pattern. 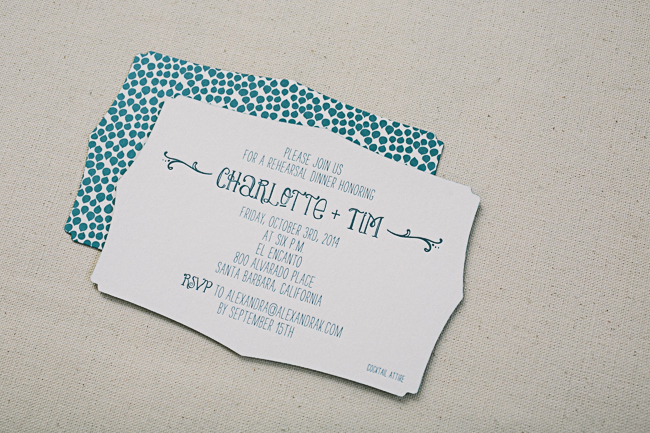 The hosts kept it casual with an email reply listed in one corner and a “dressy casual” tip in the other. 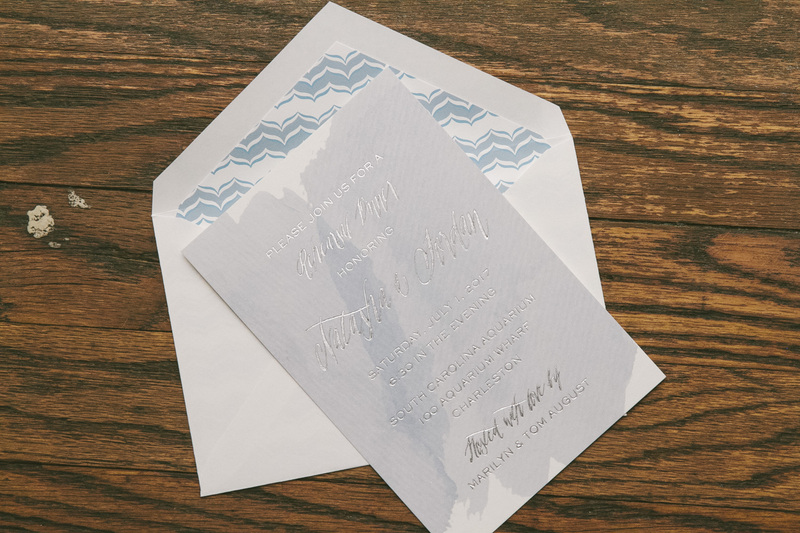 For Jenna and Eric’s rehearsal dinner invitations, we created a simple, custom invitation that tucked inside of a ticket style sleeve. 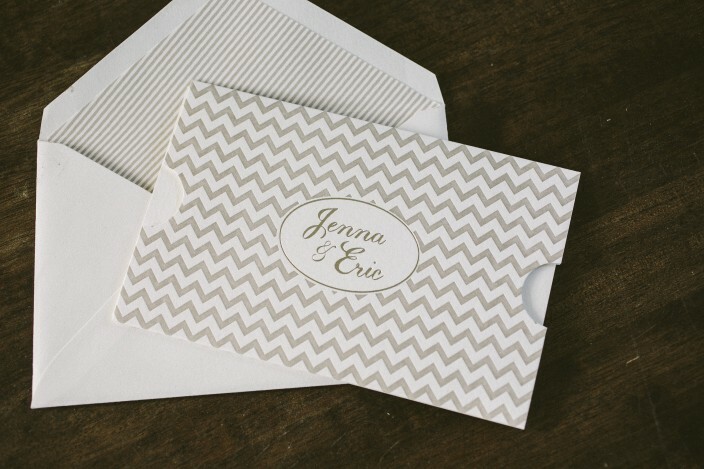 We letterpress printed our chevron pattern in jute ink on the invitation sleeves, then foil stamped the names of the bride and groom within a simple cartouche on the center of the piece. 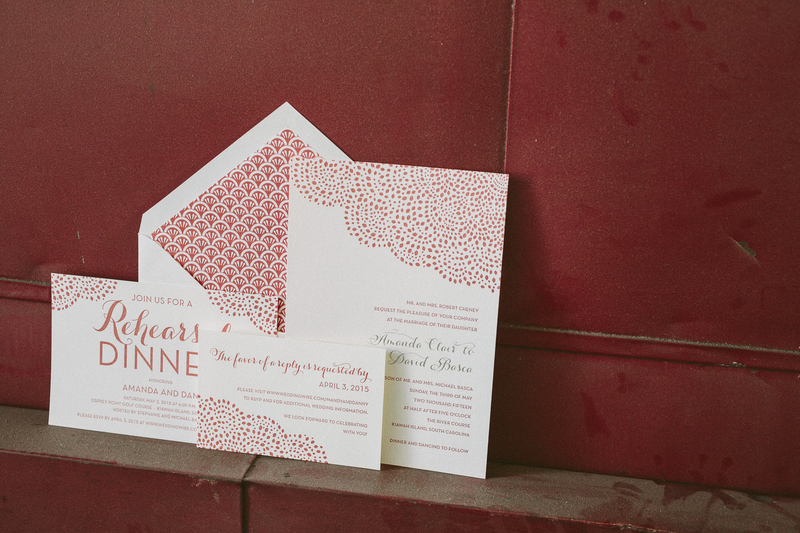 Letterpress printed envelope liners in our everett pattern added a fun element of pattern play to these sophisticated invitations. 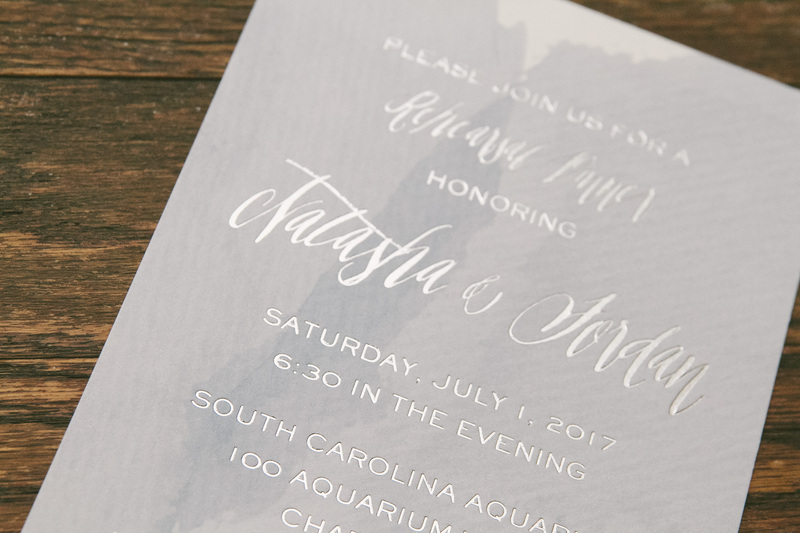 We created a completely custom letterpress invitation suite for Honor and Jay’s black tie celebration at Winvian Farm earlier this month. 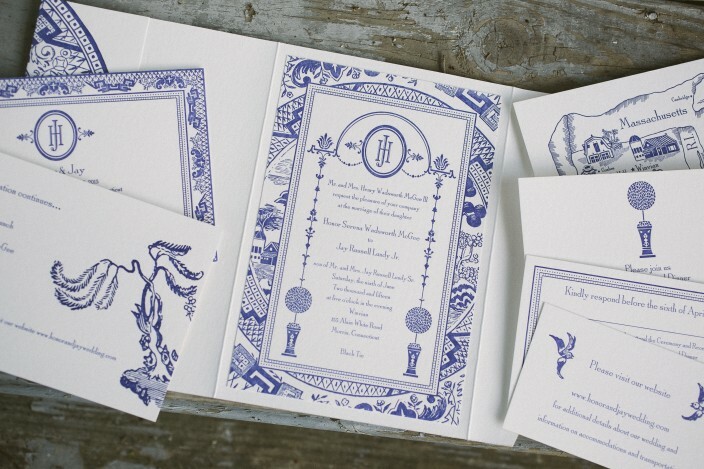 The entire suite – which included an invitation and folio, save the date, reply card, website card, rehearsal dinner invitation, brunch card, and a custom map – featured custom, hand-drawn illustrations inspired by Chinoiserie style porcelain. 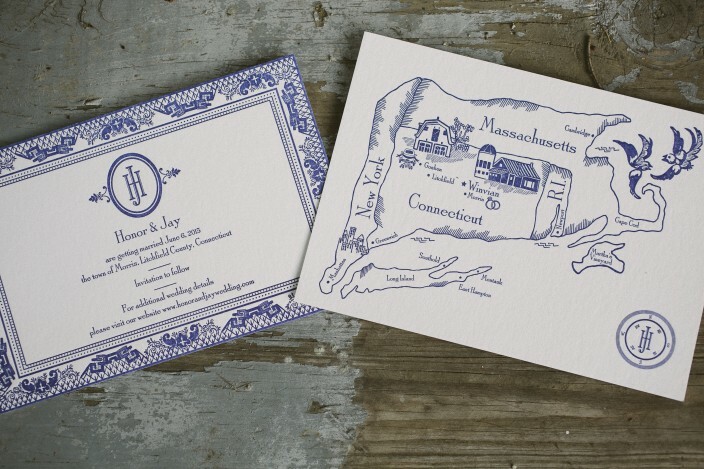 Little nods to the wedding venue were worked into the custom illustrations, which spanned the entire back of the invitation folio and were sprinkled throughout the additional pieces. 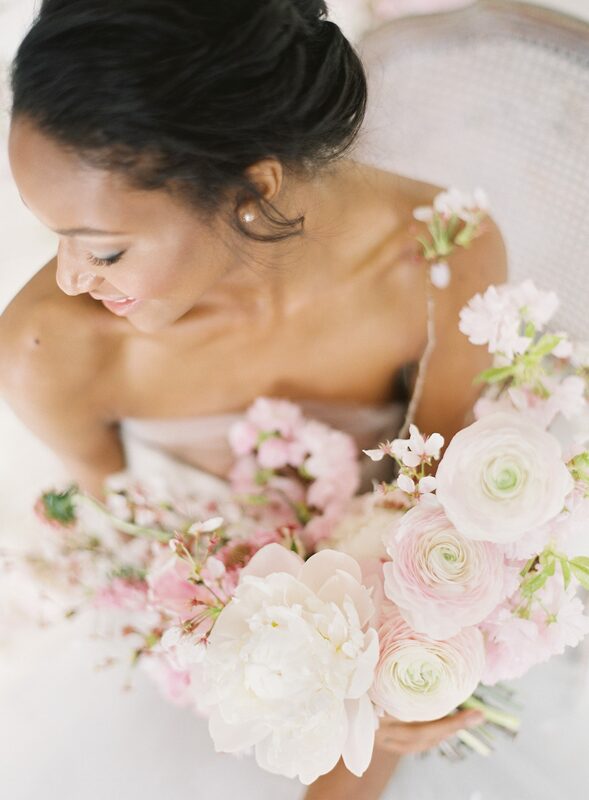 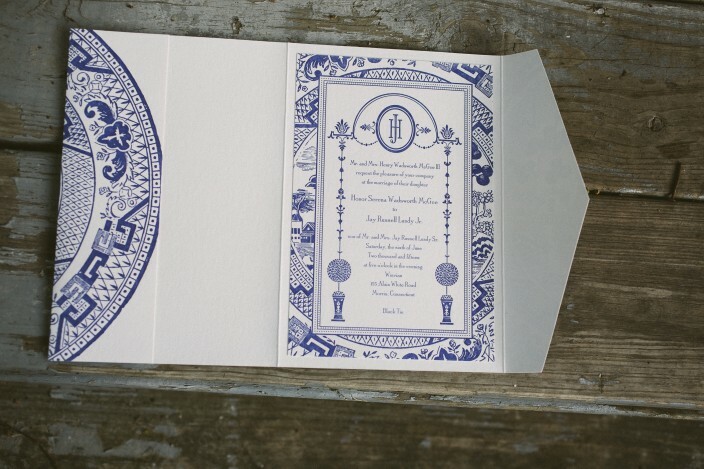 Amanda and David customized our Rainier design for their May wedding on Kiawah Island. 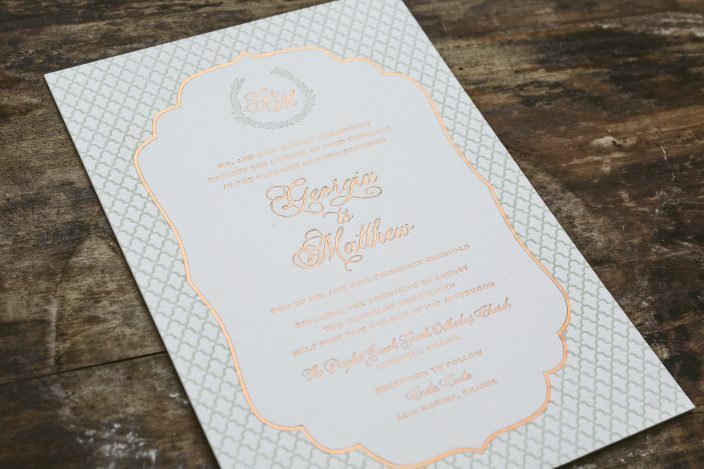 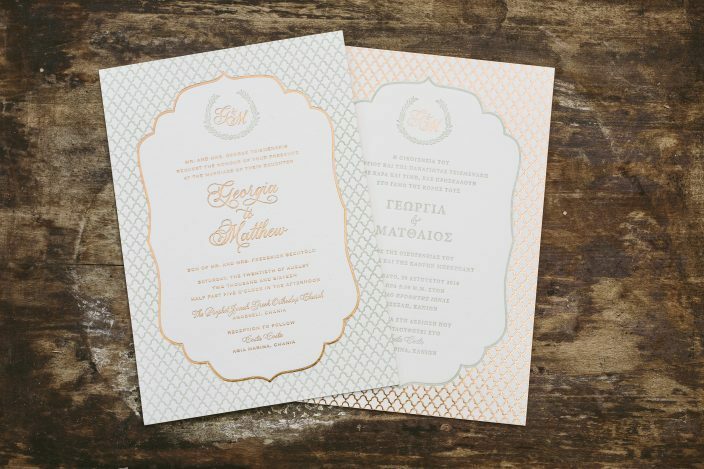 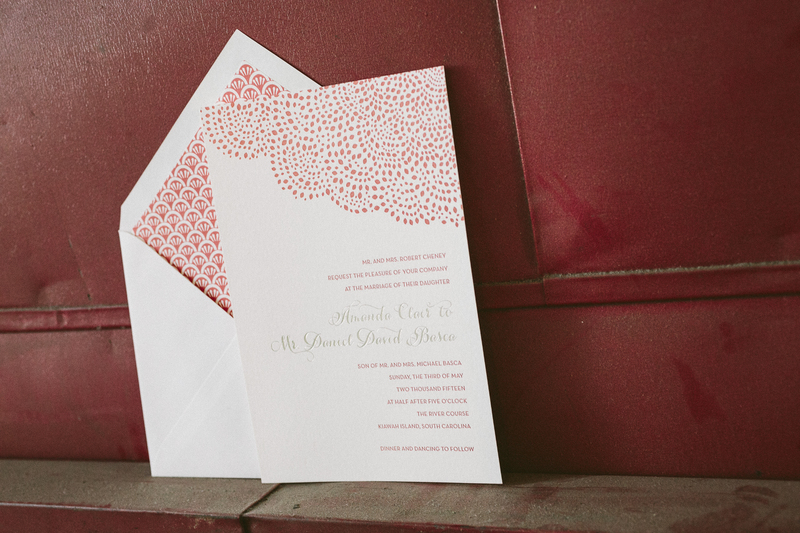 Letterpress printed in coral ink, their invitation suite included a reply card, rehearsal dinner invitations, and whimsical patterned envelope liners. 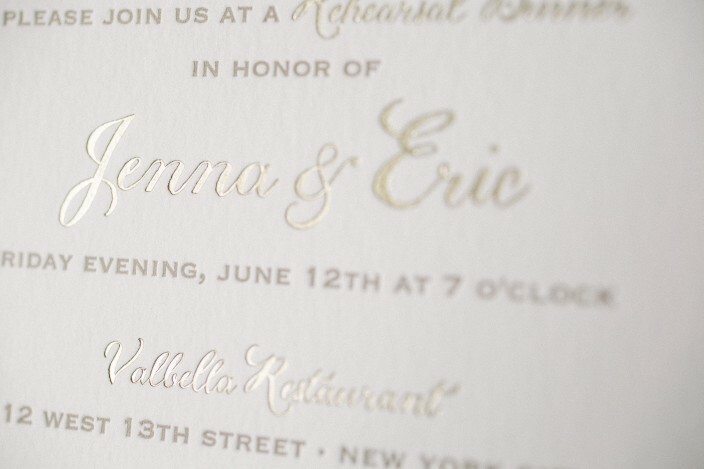 A touch of tawny matte foil was used to highlight the names of the bride and groom on the invitations. 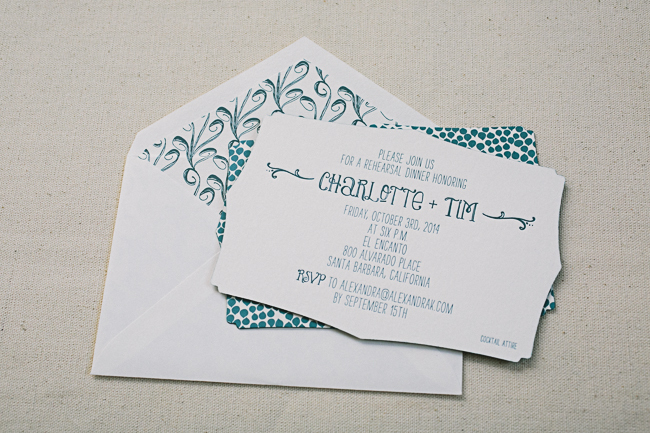 Charlotte and Tim worked with Megan at Sugar Paper to create their playful Palmer rehearsal dinner invitations. 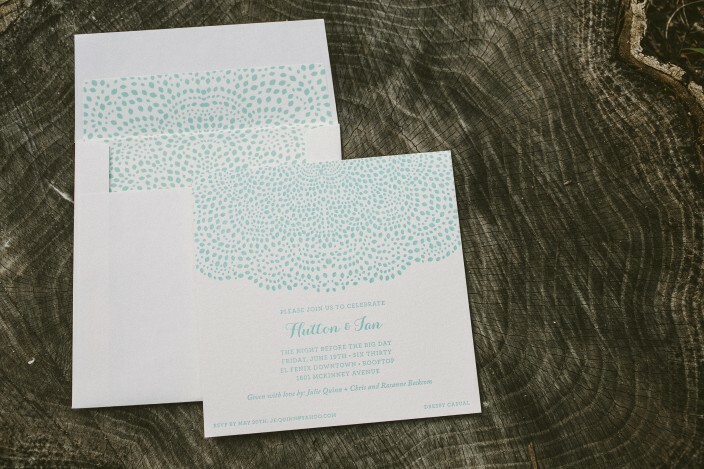 Letterpress printed in peacock ink, the invitations featured our Chesapeake die-cut shape and an offset printed patterned backing in our Chablais pattern. 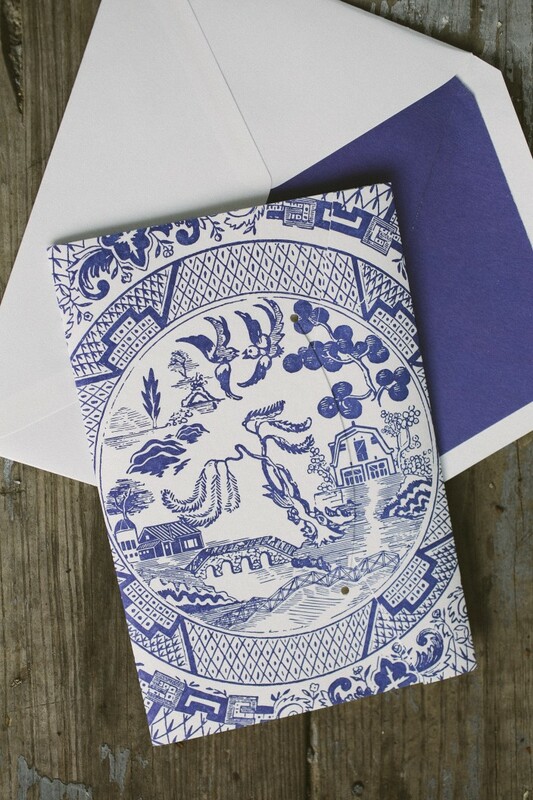 Halifax patterned envelope liners were also printed in peacock ink to tie everything together.